An explosion of advances in the area of tactile perception and pain led to the development of this comprehensive, state-of-the-art text on basic research and clinical practice. 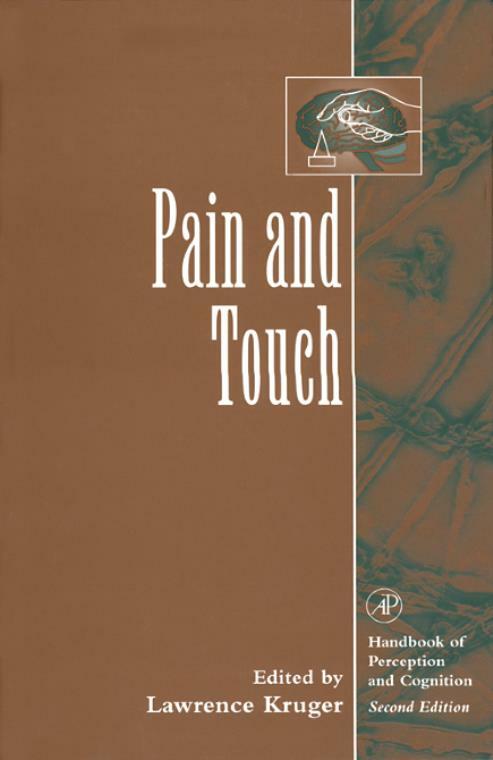 Equal parts psychology and neuroscience, Pain and Touch covers peripheral cutaneous tactile information processing, sensory mapping, tactile exploratory behavior, neurophysiology of nociception and nociceptors in pain research, clinical scaling methods for psychophysics of pain, and paincontrol, pathology, and therapeutics. J.C. Stevens and B.G. Green, History of Research on Touch.J.D. Greenspan and S.J. Bolanowski, The Psychophysics of Tactile Perception and Its Peripheral Physiological Basis.H. Burton and R. Sinclair, Somatosensory Cortex and Tactile Perceptions.E.R. Perl and L. Kruger, Nociception and Pain: Evolution of Concepts and Observations.B. Lynn and E.R. Perl, Afferent Mechanisms of Pain.R.H. Gracely and B.D. Naliboff, Measurement of Pain Sensation.C.R. Chapman and M. Stillman, Pathological Pain.R.K. Portenoy, Control of Pathological Pain. Lawrence Kruger has received several honors including the Lederle Medical Faculty, Wellcome Professor, Fogarty Senior International Scholar, and Javits Neuroscience Investigator Awards. He is the founding editor of Somatosensory and Motor Research and serves on the editorial board of several scientific journals. His publications include more than 150 papers and book contributions; he has also recently published an atlas of the rat brain (Cambridge University Press, 1995) and served as editor of volumes in the field of pain. Dr. Kruger is a Professor of Neurobiology and Anesthesiology at the UCLA Medical Center. He received a Ph.D. in Physiology at Yale University and post-doctoral training at Johns Hopkins, the College de France, and Oxford University, spending the remainder of his career at the University of California. His research has extended from animal behavioral studies and psychophysics to electrophysiology of sensory pathways and in more recent years to electron microscopy and chemical neuroanatomy relevant to touch and pain systems.